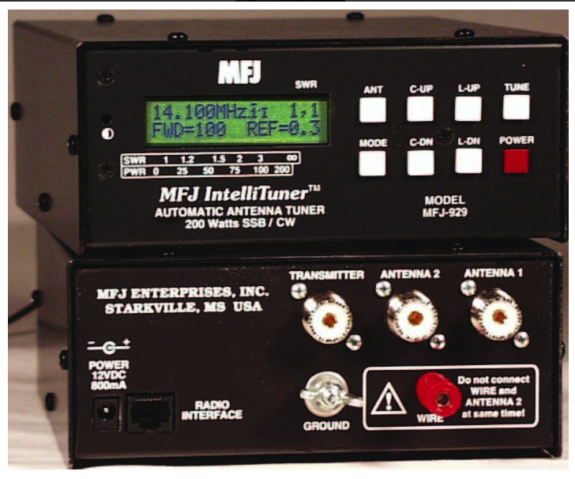 The MFJ-929 IntelliTuner-Compact™ lets you automatically tune any coax fed or random wire antenna 1.8 – 30 MHz at full 200 Watts SSB/CW. It can match 6-1600 Ohms (SWR up to 32:1) – thats a 50% wider matching range at a higher power level than lesser competing products. You get a digital SWR/Wattmeter with backlit LCD, antenna switch for 2 antennas, built-in radio interface and built-in internal BiasTee for remote tuner operation. MFJs exclusive IntelliTune™, Adaptive Search™ and InstantRecall™ algorithms give you ultra-fast automatic tuning with over 20,000 VirtualAntenna™ Memories. 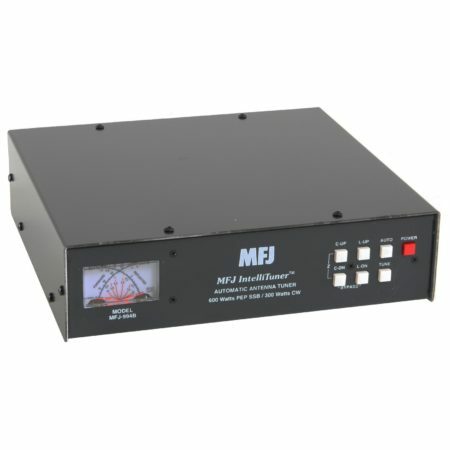 MFJ new VirtualAntenna™ Memory system gives you 4 antenna memory banks for each of 2 antenna connectors. You can select up to 4 antennas on each antenna connector. Each antenna has 2500 memories. Don`t be fooled by competing products claiming fast search times — if you have a quarter of the matching solutions, of course, it takes less time to finish but its not faster. MFJ`s faster speed comes from advanced technology and software algorithms not from fewer matching solutions. 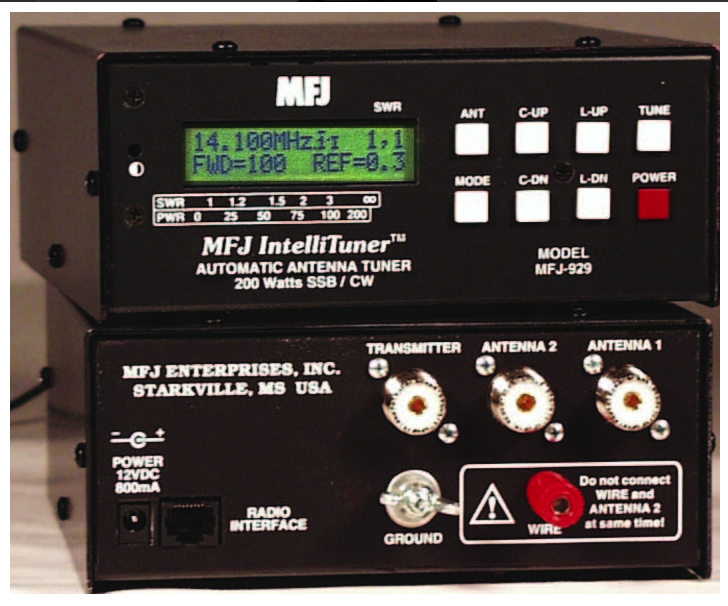 MFJ`s IntelliTuner-Compact™ actually measures complex impedance — R and X –of your antenna, computes the L-network values needed and snaps in those components to give you an instant match. If the load is out of measurement range, AdaptiveSearch™ determines the smaller sub-set from all solutions that can match a safe load — and then searches only that subset — others search through far more solutions. An easy-to-read, two-line, 16-character backlit LCD displays SWR, peak or average forward/reflected power, frequency, antenna 1 or 2, L/C tuner values, on/off indicators and other info. They are selected from easy-to-understand menus; not complex combinations of buttons you can`t remember. A fast-response, high-resolution bargraph gives you an auto-ranging 20/200 Watt power meter. You get 60 segments each for forward and reflected power and 36 segments for SWR — try that with an 8 segment bargraph that makes you change power ranges and doesnÃ¢â‚¬â„¢t even give you reflected power! You can read inductance and capacitance directly in uHy and pF. This turns you into an expert L-network designer! Match your load, read the resulting L/C values, then use them to build your fixed L-network. Or, knowing the L/C values you can determine R and X of the load impedance. StickyTune™ mode gives you one-hand tuning by locking the TUNE button; just transmit to tune regardless of SWR. Has audio SWR meter and audio feed back. Competing products don`t. Built-in 50 MHz frequency counter. Its built-in radio interface lets you use a simple wire cable to compatible rigs. Others require a cable with expensive electronics. Binding post for random wire. Self-test. Highly efficient L-network. 10 Amp/1000V relays, RF duty silver mica capacitors. 6 ½” x 2 ¾” x 7 ½”. 2.4 lbs. 12-15 VDC/ 1 Amp or 110 VAC with MFJ-1316.